This is new subway project—it’s not a secret, but I am being obtuse. You’ll have to figure out what I am doing on your own—or just wait and see. 3 points if you can guess the next step. Additional opportunities to earn points will be presented…points are worth a mil. 1000+ to win a penny --send a SASE if you want to collect your winnings. More tomorrow (I hope!) and them maybe it will make ¢s (sense). Maybe I should call this project word play! I only got a single pattern repeat completed on Peachy because I was working on the big C—I made a mistake that required frogging—and lost a good 5 inches! 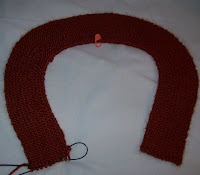 The curve is created by short rows. I have no problem at all dropping down a single stitch and working it back up with crochet hook, normally. But short row and the wraps made it hard to track EXACTLY which stitch to drop—and would have made picking up harder too, (and there were other factors in play..) Frogging was the only thing that made sense. Oh and this whole project is being winged… If you like it, you’ll have to look, think and work out the details on your own. 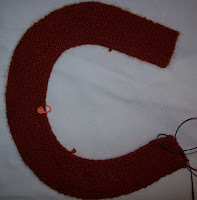 You’ve already got 1 hint --short row shaping! I dug out my February Lady—the finished length, (center front) is 24 inches. Peachy over 18 inches right now with 12 repeats of the lace pattern (each repeat is a fractional amount over an inch long) I am thinking 4 more repeats, (23 inches) then the bottom boarder of garter and the body will be completed. Most of a skein for the sleeves--that is, most of skein for EACH of the 2 sleeves, or 2 skeins—and then maybe a pair of matching ‘lower arms’ to match, as I did with the February Lady. I think a matching hat would be overkill-- a set of 2 is interesting, a set of 3 becomes tacky (or so I think! )—but I could do a hat—and wear the sweater and hat, or the sweater and arms warmers, or arm warmers and the hat –and avoid the 3 piece matching set.